There’s nothing fresh about this winter season but that doesn’t mean there isn’t something hot, opinionated, and not all that sweet–running around at will. Thank you, it was a glorious day and the horses wanted to play! Very beautiful winter photo. It’s a blessing to have well defined seasons. Absolutely beautiful! Hehehe, Most of the time I agree about the seasons; then other times not so much!! Thanks Maria. 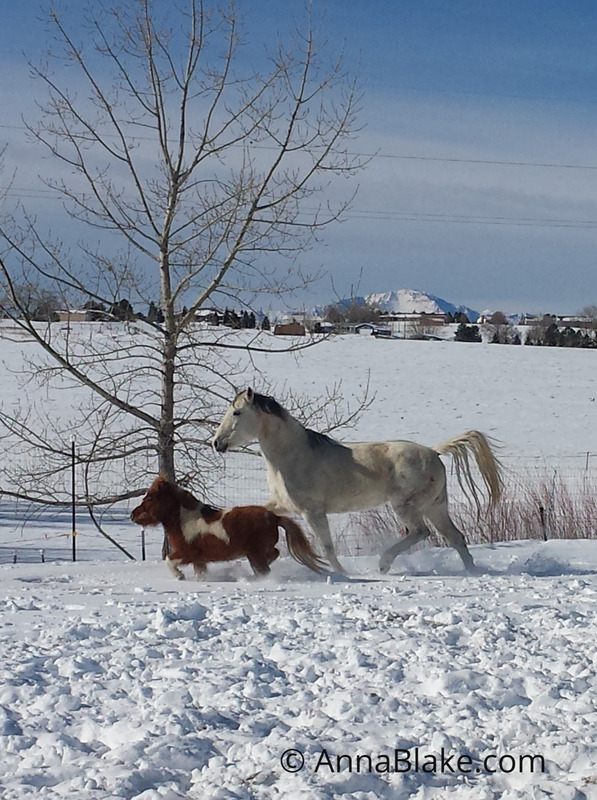 Wonderful to see Grandfather Horse so spry running with the mini! Oh gosh, I wish. Grandfather Horse hasn’t moved that well in the last 15 years… This is Clara. She thinks very highly of herself. Thanks, Sharon. Great pictures. Boy, you still have quite a bit of snow. Ours is finally leaving with warm temps and some rain for a few days. But it is still February. This can change in an instant. I want to thank you so very much for helping me get out there and listening to my horses. I also have a mini and she has a lot to say. My old man Arab is much quieter and likes to watch. He requires me to pay close attention. It is a gift and I am grateful. This photo is a couple weeks old, but it’s snowing again now… So glad to hear that things are improving. And from my experience, minis have volumes to say. Thanks for reading.